Think You Have Bed Bugs? Dig Deeper to Be Sure. If you’re worried about bed bugs, you’re not alone. Middlesex County NJ pest control companies are dealing with more and more cases of these biting pests. Before you panic about bed bugs, though, keep the following tips in mind to stay calm. If you see small, dark-colored bugs in your home, they’re not necessarily bed bugs. Other pests, such as bat bugs, have a similar appearance to bed bugs. You can’t tell from bite marks either. Spiders, some ants, and other pests can also leave bite marks on your skin. You might be tempted to sleep elsewhere if you wake up with bite marks or see bed bugs in your bedroom. However, keep in mind that bed bugs can follow you to other areas, causing a more widespread infestation. Use a bed bug mattress cover and clean your bed linens in hot water to protect yourself from additional bites. Throwing out furniture and other items that you think are infested could allow bed bugs to spread to other areas or to other people’s residences. Let professional pest control experts determine if you have an infestation first. If you think you have a bed bug problem, you’ll need reliable help from Middlesex County NJ pest control companies. Contact Allison Pest Control to learn more about our bed bug services. Look Out For Bed Bugs on Your Dark Clothes and Sheets! You’ve just discovered a bed bug infestation in your home, and you’ve done all the right things. First, you called the best exterminator in Freehold, then you’ve taken the time to do some research on how to protect yourself and your family. Now all you have to worry about is getting relief from those itchy bed bug bites. It’s important to know how to treat them so you can reduce the swelling and welts, and stop the itching. 1. Wash the area with soap and water. 2. Avoid scratching your bites, which will only make them itch more. 3. Watch for signs of infection, such as swelling or a fever. If you suspect an infection, go to the doctor. 4. Consider anti-histamine creams for severe itching. Bed bug bites may take a bit longer than mosquito bites to heal and go away. In the meantime, keep following the above steps and make sure you get treatment from the best exterminator in Freehold. At Allison Pest Control, we will you put you back in control of your home. Contact us for help! How Long Have You Had This Bed Bug Problem? How Professionals Know. Finding out you have bed bugs usually comes as a pretty big shock. Some victims want to know how long they’ve had them because there may be some satisfaction in knowing (or suspecting) how they came to be infested. You may be wondering the same thing, too, if you’ve recently discovered an infestation in your home. For smaller infestations, it’s much easier to determine their ages because professionals can look at how many bugs are present, the number of eggs, and the various stages of life that are there. If you have a bed bug infestation at your home, the most important thing you can do is to get treatment as quickly as possible. As the best exterminator in Brielle, we can do a thorough inspection and provide you with the best treatment options for your home. If you would like to know more, or schedule an inspection, please contact us! Feeling Itchy? Could You Have Bed Bugs? If you wake up feeling itchy and notice red marks on your skin, bed bugs might be the culprit. These tiny critters have been spreading throughout the country, including NJ. While they rarely cause medical issues, their bites can cause an allergic reaction. Bed bugs bite humans in order to feed on blood. You most likely won’t notice the actual bites when they occur, since they’re painless. Instead, your body might react to the saliva that the bugs leave behind with their bites. This saliva can cause your skin to turn red around the bite mark, and it might itch as well. If you have a severe allergic reaction, you might experience respiratory symptoms that are very similar to asthma, although this doesn’t happen often. Bed bugs have the potential to transmit several diseases, but they haven’t caused any serious outbreaks so far. It’s still a good idea to have these pests removed from your home as soon as you notice any signs of an infestation, such as seeing the actual bugs or seeing tiny drops of dried blood on your bedding. Since they can be difficult to get rid of, it’s best to get professional help. If you think you have a bed bug infestation, you’ll need a reliable Monmouth County pest control company to help you out. Contact Allison Pest Control, and we’ll rid your home of bed bugs quickly. Do Bed Bugs Really Bite In A Row Of Three? Bed bugs bites are normally not felt by those who are unlucky enough to encounter the pests. The bloodsuckers are rarely ever felt doing their dirty work and they kindly inject their victims with a numbing agent to keep their presence a secret. 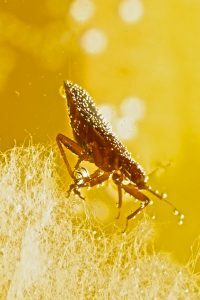 Some people who are bitten by bed bugs suffer from wicked bite wounds while others that will be bitten do not show any problem with the pests in the slightest. 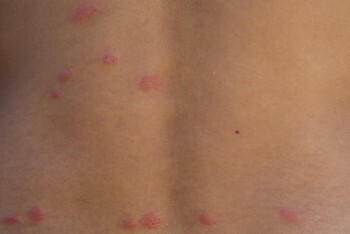 When people talk about receiving bed bug bites, they often report that they are bitten in rows of three. Some people refer to these bites as “breakfast, lunch and dinner”. When bed bugs bite they need approximately 10 minutes to feed completely. They often bite their victims three times for about three minutes or so. 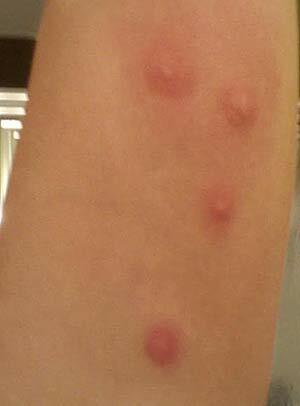 This is why bed bug bite wounds are often found in a row of three, but it should be noted that bite wounds can also be found in a cluster or even individually. There is no set rule when it comes to bed bugs bites. Lou Sorkin, an Entomologist, provided some great images of bed bugs feeding and explained why bed bug bites often occurred in a line or cluster. According to his reports to Bedbugger.com on February 25, 2013, his research has shown that bed bugs do not need to crawl onto a person in order to feed. A bed bug can crawl next to a person on the sheets or blankets and extend its proboscis into a small blood vessel of a sleeping person to feed. It seems to be common sense that when bed bugs are found in a hospital by a relative who is visiting, that the pests are reported. After the pests are found, it would seem logical that a licensed pest control expert is called to the scene to eradicate the insects. In the United States, when bed bugs have been found in a hospital, it is big news! Hospitals often shift patients from place to place as the entire wing undergoes pest control services. No hospital wants to be known as one that is passing bed bugs on to others in the public, and worse yet they do not want to be known as a hospital that has bed bugs biting their patients. Bed bugs are a public relations nightmare that must be addressed swiftly! Global Toronto reported on December 30, 2012 that a woman ho complained about bed bugs biting residents at a veteran’s hospital in Toronto, Canada faced serious repercussions from hospital staff. Reports are that after the complaint was made and while visiting her 91 year old father, the woman was escorted out of the building by security officers and police. She was further told that she was not allowed to enter the building again for any reason in the future or she would be arrested! As the story was reported, the woman had to send someone to gather her elderly father so that he could spend his 70th anniversary with his 93 year old wife. This situation is absolutely unbelievable and one that would not be tolerated for one day in the United States!